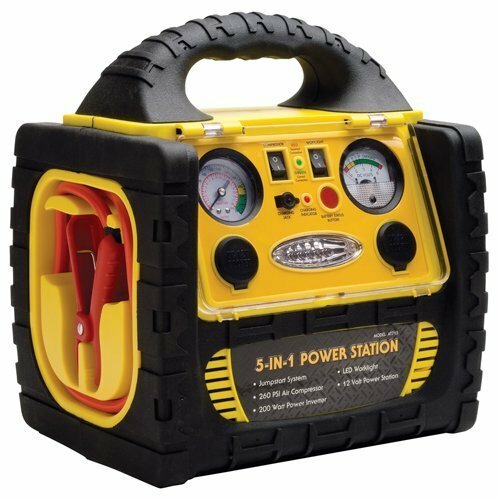 Unfortunately, the RoadPro RPAT-715, 5-in-1 Jump Starter, Inverter, Power Source & Inflator is no longer available. You can explore other items in the Jump Starters category yourself to try and find the perfect replacement for you! 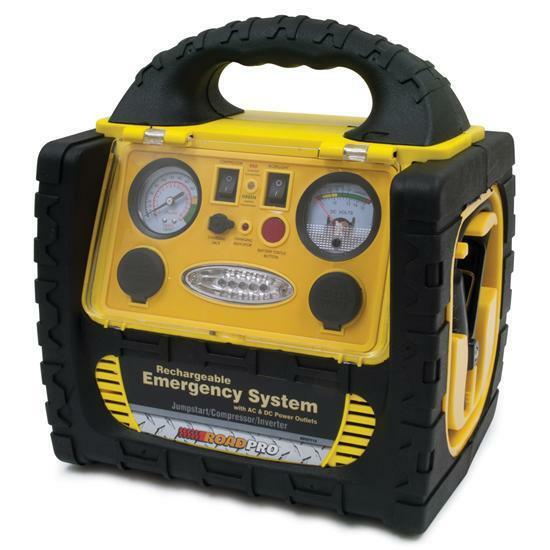 RoadPro RPAT-715 is a multifunction 5-in-1 emergency power source and jump starter. It can provide 110 volts AC or 12-volt DC to be used for variety of applications including but not limited to computers, portable TVs, fax machines, audio, fans, electrical tools, etc. More powerful than the Wagan PowerDome 2354, the RPAT-715 will exceed all expectations. The RoadPro RPAT-715 is not just an emergency source of power, but it can easily (and more importantly, quickly) jump start your car even in the most adverse conditions and weather. The winter months are already hard enough on car batteries, making the winter the most probable - and inconvenient - time your battery to fail. Keeping this Power-pack stored in your backseat or trunk will provide you with the peace of mind and confidence you need to go for a long drive. Properly inflated tires help you , extend tire life, prevent accidents and even save gas. With a dual AC outlets that provides 200 watts (400 Watts surge) of pure sine wave power. This inverter powers a wide range of devices such as cell phone chargers, TVs and radios. 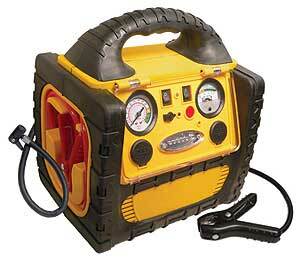 The built-in 12 volt air compressor inflates sports equipment, tires rafts and bike tires. UL Listed Dimensions (inches): 10.5" x 11.5" x 8.5"
My brother has this jump starter and it's great. We went on a road trip to Lake Tahoe and his tire was getting a little low when we descended down the hill. He drove a suburban and it had no problems filling up the tires. After that I decided to get one too. I leave it in my trunk and it hardly takes any space. I jump started my wife's car with it and it had no problems. It's nice not having to get both cars face to face in a parking lot to do a jump start. Might buy one to keep in her car too! I haven't used the power ports, but next camping trip I'll see how long we can run our speakers with it.